Most cats don’t need to be bathed unless they get toxic substances on their fur, but certain breeds (such as the Sphynx) that are nearly hairless require regular bathing to remove a build-up of skin oil. Also, those who participate in cat shows are required to bathe their cats regularly. When bathing a cat, use only non-toxic shampoos and conditioners designed specifically for cats. Products intended for dogs or people and household cleaning soaps are often toxic to cats and should be avoided. Ideally there should be two people to administer the bath, but if this isn’t possible, wearing thick gloves and shirt with long thick sleeves is recommended in case the cat becomes panicked and scratches or bites in an attempt to escape. Placing a rubber anti-slip mat in the tub or basin to keep the cat from sliding around is also a good idea. Fill the tub or basin with just a few inches of water (to the height of the cat’s belly when she is standing). Water should be about the same temperature as the cat’s body. Place the cat in the water and gently lather her fur with cat shampoo. Use a washcloth to carefully clean her face and head so as to avoid dripping shampoo or water into her eyes and ears. 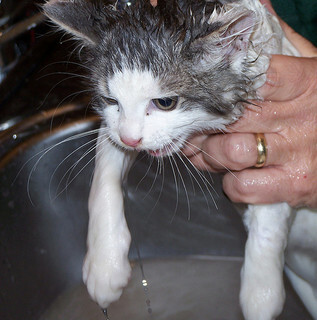 Then use a cup or bowl to pour water over the cat’s body to rinse off the shampoo, being careful not to splash her face. Be sure to rinse the cat thoroughly to remove any shampoo residue and then run your hands gently over her fur to squeeze out excess water. Many cats find bathing traumatic. An alternative for a cat that panics when immersed in water is to give her a gentle rubdown with a washcloth soaked in warm water only (no soap). This should be sufficient to remove non-toxic, non-sticky substances from the fur, such as dirt or dust. After bathing, there is a risk that the cat will become dangerously chilled, and this risk is particularly serious for very young and elderly cats. Always bathe the cat in a warm room and dry her thoroughly afterward. Some cats will tolerate being dried with a blow dryer as long as it’s not too hot, but other cats will find this frightening and should instead be rubbed gently with a warm, fluffy towel. A cat that has gotten a toxic substance on herself should be bathed right away to prevent her licking the substance from her fur. In such cases, the owner should wear plastic gloves when bathing the cat to prevent getting the substance on his own skin, and consulting a veterinarian or the ASPCA Poison Control Center hotline (1-888-426-4435) is recommended. Never use solvents such as paint thinner, gasoline, or turpentine to remove substances from a cat’s fur. Some substances, such as tar or paint, may have to be cut out of the fur, though rubbing petroleum jelly (Vaseline) or vegetable oil into the fur and working the substance out with the fingers is often effective. In the unfortunate event that the cat is sprayed by a skunk, there is a product called Nature’s Miracle Skunk Odor Remover that will safely remove skunk odor. This product is far more effective than the more commonly used tomato juice bath remedy. Having some Nature’s Miracle on hand for emergencies is a good idea, particularly for outdoor cats. A trip to the veterinarian after a skunk-related incident is also recommended, particularly if the cat has been injured in a physical confrontation with the skunk or sprayed in the eyes, which can cause severe irritation. A common reason that people bathe their cats is to deal with a flea infestation. However, one of the best ways to prevent adult fleas is to regularly comb the cat with a fine-tooth comb to remove flea eggs before they hatch. See Natural Flea Control for additional non-toxic flea prevention options. See How to Groom a Cat for information on how often long- and short-haired cats should be groomed, as well as grooming tools, tips, and tricks. For more cat articles, see the main Cats page. Reference: Brunner, David, Stall, Sam, Kepple, Paul, & Buffum, Jude. (2004). The Cat Owner’s Manual. San Francisco, CA: Chronicle Books.